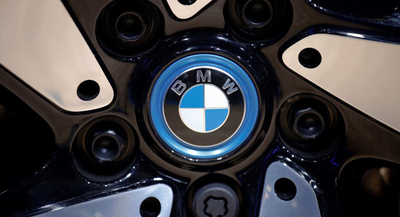 Two more BMWs caught fire on Thursday, one of them a model that was not subject to a massive recall. The BMW 730Ld caught fire on a highway in Sacheon, South Gyeongsang Province. No casualties were reported but the car burned out completely. The driver had stopped the car in a rest area to swap seats with a friend, but soon after flames shot out under the hood. The 730Ld, a 2011 model, is not on the list of cars subject to the recall, which covers only 730Lds made between July 2012 and January 2015. Burned-out BMW sit on expressways in Sacheon, South Gyeongsang Province and Anyang, Gyeonggi Province on Thursday. 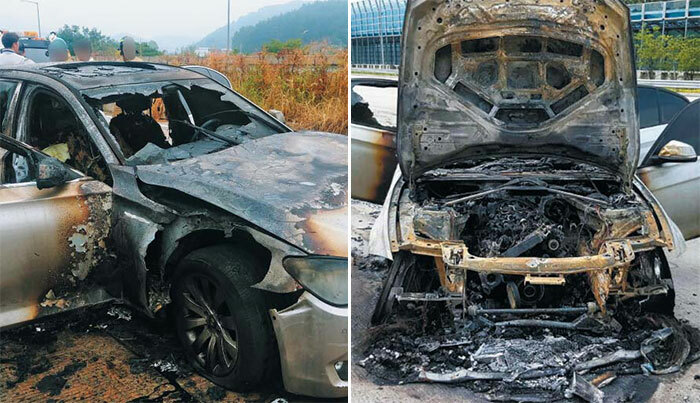 A BMW 320d also caught fire near a tunnel in Anyang, Gyeonggi Province. The driver said, "I'd been driving down the highway for about 20 minutes when an alarm lit up on the dashboard and smoke emerged from under the hood." The car was made in 2014 and is on the list. The Ministry of Land, Infrastructure and Transport sent inspectors to the scenes of the fires. Meanwhile, 21 owners of BMWs that caught fire filed a criminal complaint against the German automaker and its six executives, accusing them of hiding defects. Why Are BMWs Catching Fire in Korea?